This web site archives data from many published experiments on letter similarity. It is presents stimuli and data from many different attempts to capture the similarity structure of the alphabet. Not all identified data sets have been transcribed and placed in this on-line archive. References for complete list are available here. Christoph Weidemann Contributed to the literature review here. MTU Undergraduate Jayde Croschere has contributed to updating and maintaning the archive. Summary of experiments reporting letter similarity matrices. Podgorny and Garner, 1979 Same-different choice RT U 5x7 Dot matrix chars. Subjective similarity ratings U 5x7 Dot matrix chars. Gilmore, et al., 1979 Naming errors of brief stimuli U 5x7 Dot matrix chars. Kikuchu, et al., 1979 Tactile letter identification U 17x17 Dot matrix chars. Craig, 1979 Tactile letter identification U 6x18 Dot matrix chars. 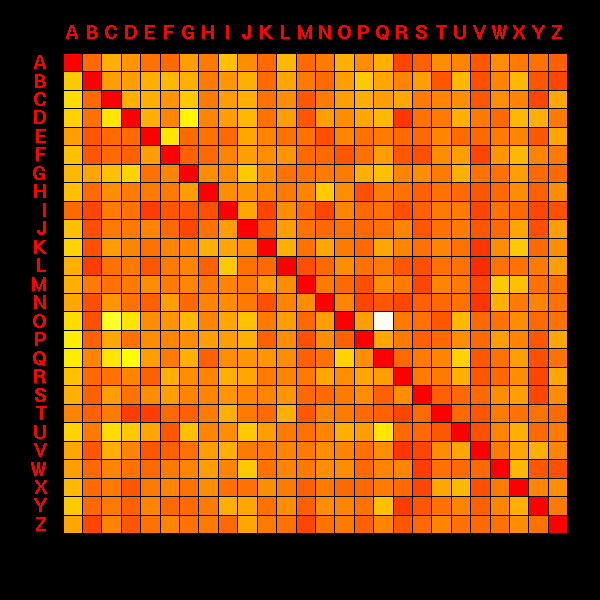 Keren and Beggen, 1981 *Feature analysis U 5x7 Dot matrix chars. Gupta, et al., 1983 Naming errors of brief dim stimuli U 5x7 Dot matrix chars. McGraw, et al., 1994 Letter identification with keyboard L ``Gridfont'' chars. Note. In the Case column, ``L'' indicates lowercase, ``U'' indicates uppercase, and ``B'' indicates both cases were studied. Methods denoted with an * were measures developed by analyzing the visual form of letters, and not directly based on empirical data. This archive was created and is maintained by Shane T. Mueller, Ph.D., who can be reached in regards to this archive at [shanem at mtu dot edu].